Be Our Guest At Cedar Valley Pub & Restaurant! You’re invited to Cedar Valley Pub & Restaurant, where a relaxed atmosphere, gorgeous view, and excellent food awaits! Located in the upper level of the Clubhouse, Cedar Valley Pub & Restaurant has been a destination for culinary adventurers since 1992. Our chef prepares a delicious Friday night fish fry and Saturday night prime rib meal. Additionally, we offer a complete menu of dinner entrees and many exquisite desserts. Our newest tradition is a Sunday brunch, where omelets are prepared to order. No matter your taste, you are sure to enjoy dining at Cedar Valley Pub & Restaurant! Looking for a special occasion venue? 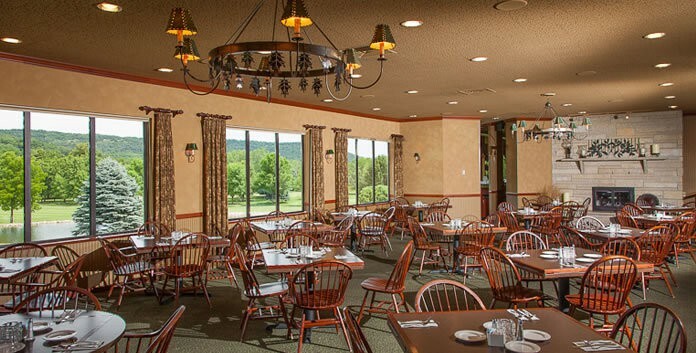 Cedar Valley Pub & Restaurant can also host private banquets, rehearsal dinners, corporate functions, and special occasions, with seating from 20 to 70 or more guests. For more information, visit our Event Planning page. Please note: Our facilities may be closed to the public for private banquets or special occasions. We recommend making reservations in advance and checking the Events page.